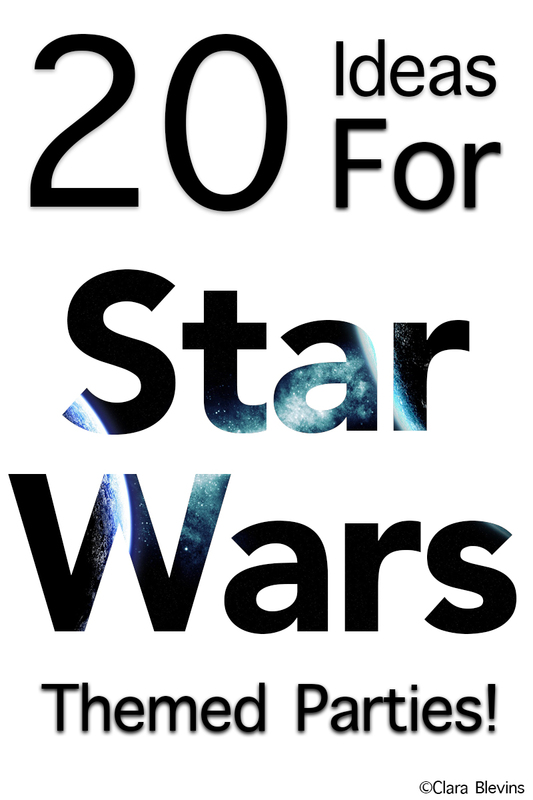 20 Ideas for Star Wars Themed Parties! Every year, I choose a theme for my birthday party. With choosing the theme comes deciding how I want my birthday cake to look, and what other things I want to do the day of (crafts, activities, etc). Not all of my ideas get done but it is searching for ideas is the really fun part. Since the new Star Wars® movie coming out in December right around my birthday, I have been collecting ideas for Star Wars themed crafts and cakes. I have found some really cool stuff and was honestly surprised by how many ideas I was able to discover, even when I wasn’t looking! Here are the Top 20 Cool Ideas for Star Wars Themed Parties! 3. Entire Cover Girl Star Wars: The Force Awakens Make-up collection My sister and cousins would love to try these make up collections out! 4. Princess Leia Cupcakes Don’t like pumpkin muffins? Try these Leia cupcakes! 5. Galaxy Jar I mean… A galaxy in a jar? How cool is that! 6. Wookie Granola Bars What a fun snack idea! 8. Star Wars Breakfast This is one super cool way to make breakfast! 11. Milk Jug Storm Trooper Helmet This is such a perfect way to recycle milk jugs and have fun at the same time! 12. Free Star Wars Unit Study and Printables (Middle School) These look fun and the post links to some cool stuff! 14. May the 4th be With You – Star Wars Coloring Pages Need a way to entertain the younger ones? All you need is a few colored pencils, markers, or crayons and these cool coloring pages. 16. Star Wars Rice Krispies® Treats These super cool looking rice krispies treats are ready for any celebration! 17. Star Wars Themed Nerf® Games Nerf games are awesome and can easily tire everyone out. 18. DIY Lightsaber Reading Pointers Another cool project that everyone will want to do! 19. Star Wars Themed Game Pack Every party has a game or two, and a Star Wars party is no exception! 20. Star Wars Rebels Inspired Popcorn Balls Popcorn, Chocolate, and marshmallows… Sounds delicious! Want more fun or delicious ideas? This post is part of my 20 Things Series!